Advertising with illuminated fabric displays offers a soft and sophisticated look. SEG signage frames provide the means if you already have or plan to print your own graphics. Using an industry standard design, these fabric light boxes all feature silicone edge channels running around the perimeter. Since our SEG signage frames are available in regular poster formats, no matter where you get your graphics done — they will fit. LED backlit signs always make excellent choices for advertising, due to the soft glow emanating from within. 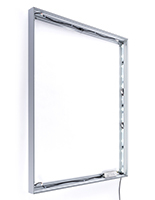 Offering less framing and more graphics, SEG signage frames are very popular in retail environments, exhibits, and showrooms. 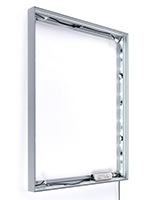 What are the main features of these tension fabric light boxes? 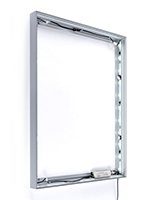 Illumination — Our SEG signage frames feature LED strips with wide beam angles. Running along the two largest sides, the lights are evenly spaced for a smooth, illuminated appearance. Color temperature is a super bright 6500K. 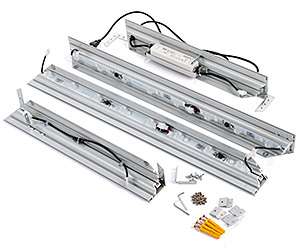 These "natural daylight" LEDs are the perfect choice for advertising graphics and come with an 8' power cord. Frameless — Manufactured from extruded aluminum with a satin silver anodized finish, our signage frames provide the strength necessary to display fabric prints under tension. The light boxes are 3.125" deep and come in 24" x 36", 36" x 48", and 40" x 60" poster sizes. Since the silicone beading is designed to be pressed in at the very edge, a frameless look is achieved. The graphics area is not only maximized, but it's also fully illuminated right to the inner edge of the light box. Easy Updating — What makes silicone edge graphics so appealing is their simple installation. The process requires minimal effort to swap out an old graphic with a new one. The press fit provides a seamless and smooth presentation across the entire surface. You get the continuous flat look of a rigid substrate but with soft and forgiving fabric — with zero glare. Marketing and advertising with SEG graphics have many advantages. The dye-sublimated fabric can be cleaned in any standard washing machine and reused. In addition, when it comes to larger formats, rigid media can be cumbersome. This is true not only during installation, but it also affects shipping and storage. Transporting a rigid 4' x 8' sign has its difficulties. Fabric, on the other hand, is lightweight and can be folded and mailed in an envelope. Think of the cost savings of that alone. The risk of damage from folding the fabric is negligible during handling or storage. For your next application, are you thinking of purchasing both the frame and graphic together? Light boxes with SEG print sets enable one-stop shopping and, ultimately, convenience!